When you’ve got 3 boys and they are growing up fast it’s hard not to make all their rooms almost identical. 2 are teenagers and the 3rd is almost. We’ve done away with toys and lego (we’ve saved some for our cousins!) but the days of little kid stuff is well and truly over. I do love that I don’t need storage for toys anymore! I visit houses for styling consults and the biggest challenge is always the toys and books. Boys can be tricky. When they are little you can choose wildly. Girls can have lots of colour. 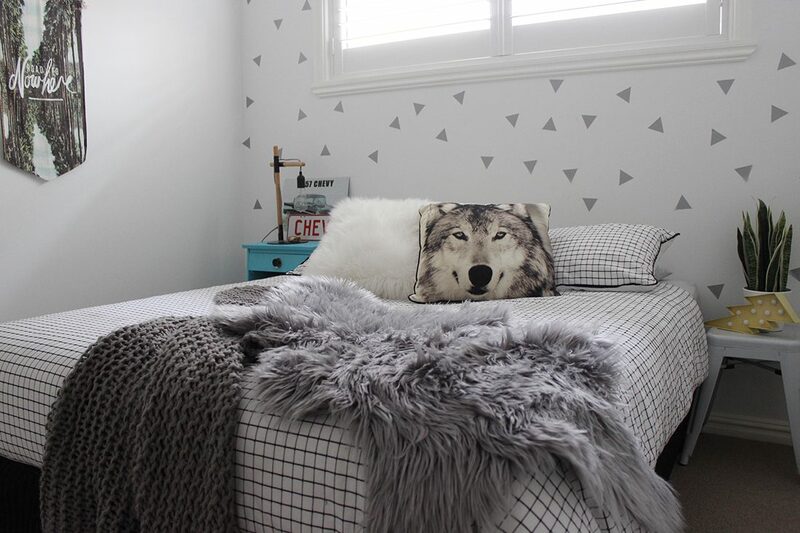 When boys start to be become teens their rooms start to be paired back. An adult feel comes over them. Black, grey and blue are safe colours. Keep it simple – so simple that you’re not even sure it looks like a kid lives in there! My boys can be messy, they don’t love fuss and anything too wild really won’t suit their personalities. 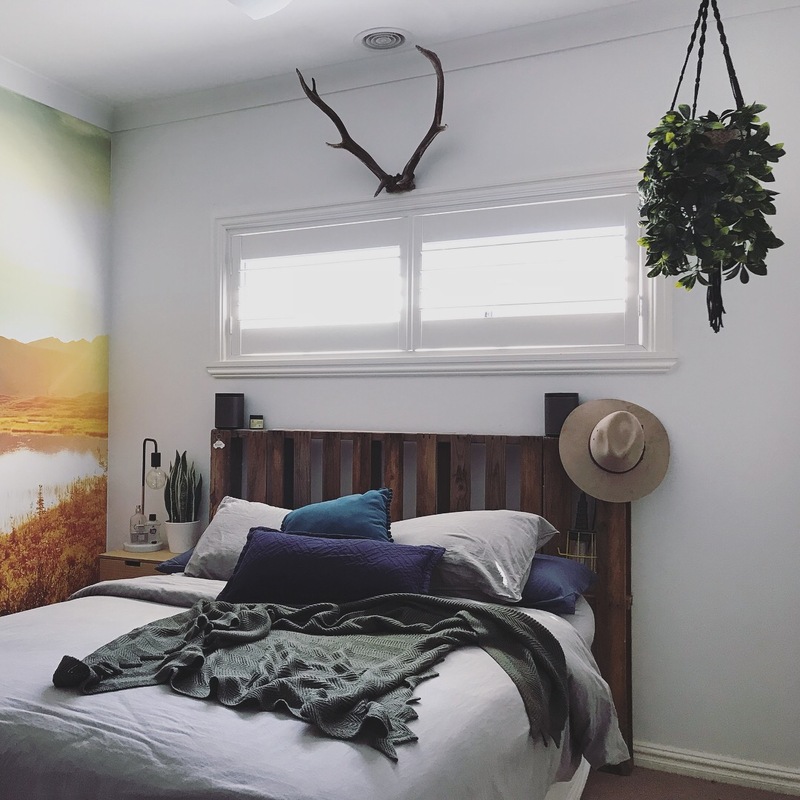 Choose timeless – when they hit the teens that will probably be the last time you’ll ‘decorate’ their rooms (until they move out and hand you a spare room back!). If you know this room will do them for the next 5 years, then choose timeless. You won’t be wasting money re-doing it in 12 months’ time. Be mindful of colour – colour is good in the short-term, but fashions change. The burnt orange or aqua may not look so good in a few months. If you do want some colour, just use it on the bed as that’s easy to update. Go with more textures. Think size – think about this long term. We’ve slowly updated all the kids to a queen size bed. This will last them many years. The good thing too is that I have plenty of bedding I can share around. Accessories – add things which suit their personality. I have done that with each of mine. 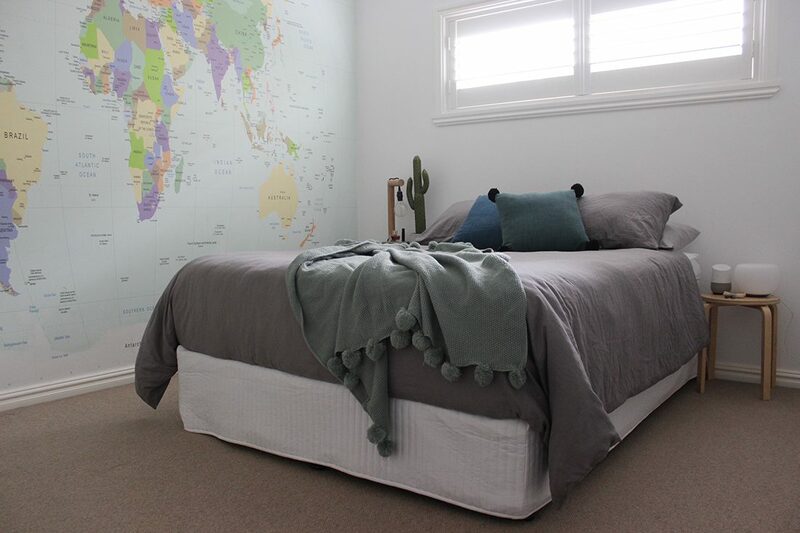 The wall murals are removable wallpaper, so they can easily come off and not ruin the walls. We have an outdoor bush theme and a world map. They are the hero features of the room. The boys’ rooms mostly don’t change. Occasionally I switch the cushions around, but their doona covers are plain and work well with less fuss. The pallet bedhead I made, and the other boys don’t have one because we sit the beds under their windows. We do have wall mounted shelves at the end of their beds with precious things, trophies and a tv. There are also sliding robes on a side wall for all their (messy and shoved in) clothes. Previous Article Previous post: Review: Hoover React Advantage Handstick vacuum plus WIN one! I have always loved your boys rooms, however I just cant get mine to be that de-cluttered. Do you have desks in their that we cant see? Hi Katrina, can you please share where you ordered the wall murals from?